Your puppy is about to be separated from the place, the people, and the littermates he/she is used to for the first time. Leaving home can be stressful and confusing for an eight-week-old puppy. There are steps you can take to minimize the stress. Secure a small crate in the back seat of your car. Do not come alone to pick up your puppy. Plan to come in the morning or early afternoon so your puppy will have some time to explore his/her new environment before bedtime. Bring paper towels and plastic bags to clean up any accidents. Bring a leash and collar. You may need to make a stop before you reach your home. Bring a few toys with you to help distract the puppy. Put the puppy in the crate and leave the door open. Ask a family member or friend to sit on the seat next to the puppy. It's important to speak to the puppy with a calm, quiet voice. Soft music may help comfort your puppy. Be prepared for crying, whining, and howling! Take your puppy to the outdoor potty area you have selected. Allow the puppy to explore for several minutes. Wait until your puppy has eliminated before you take him/her into the house. Provide a calm, quiet environment. 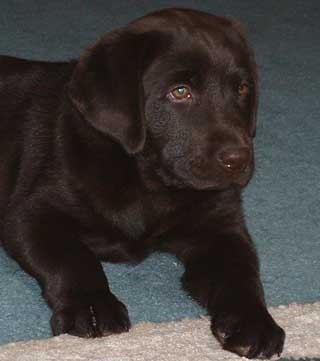 Allow the puppy to investigate the areas of the house he/she will have access to. Introduce the puppy to his crate or indoor pen. Toss a small treat into the crate, and let the puppy go in and out of the crate. Allow the puppy to visit with the members of the family and play with his/her new toys. Take the puppy outside to the potty area after about an hour. Your puppy still needs a calm, consistent environment. Avoid outings away from home. The puppy needs time to adjust to his/her new surroundings. Take the puppy to a veterinarian as soon as possible. Discourage visits from family, friends, and neighbors for 3 or 4 days. Give your puppy time bond with his/her new family. Expect several sleepless nights. Some puppies whimper a little and others cry a lot! Be patient. It will get better. For the first few weeks, little puppies need at least one potty break during the night. Start teaching the recall as soon as your puppy knows his/her name. Using an upbeat voice, say the puppy's name and the command "COME" or "HERE". Reward the puppy for coming to you with lots of praise and a small treat. Make this game a fun-filled game for your puppy. Practice daily! Coming when called must always be positive experience for your dog. Begin leash training. Let your puppy get use to the collar and then attach the leash. Initially, let the puppy lead you around the yard. Then, avoid leash correction by keeping your puppy's attention with verbal encouragement and praise. Establish a consistent schedule as soon as possible. Feed your puppy 3 times a day at approximately the same time in the same location. Keep the water bowl in the same location. Use the same door to take the puppy outside to the potty area. It's easier to housetrain a puppy that is kept on a schedule. Puppies need frequent naps and several short walks throughout the day. After the first week, slowly introduce your puppy to new sites and sounds. Start with short trips to meet family, friends, and neighbors. One brief outing a day is enough for a little puppy. During this period, try to avoid loud and hectic situations that might overwhelm the puppy. Avoid exposing your puppy to dogs that may not be vaccinated and areas where these dog can be found.